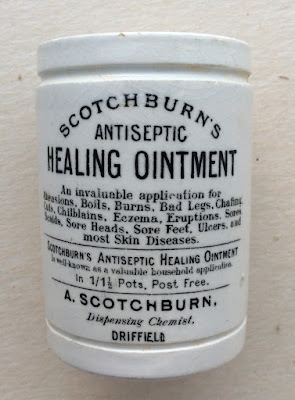 Alfred Scotchburn was born in Driffield in 1874 and the first listing in Kelly's directory appeared in 1901 recording him a as chemist, druggist and cattle medicine manufacturer. The pot is believed to be known in different sizes however the pot only lists one price. The content size of 60ml is marked on the underside. book produced by Messrs. Houghton & Priestley, page123.